The "Butterfly Effect," or more technically, "sensitive dependence on initial conditions," is the essence of chaos. Clicking on the image above will take you to a Java applet at CalTech that will let you change the parameters of the system. This animation demonstrates Brownian motion. Brownian motion is an old concept and does not really have anything to do with Chaos or Complexity per se—it really is random movement, though it can often look quite like it has some purpose or direction. The big particle can be considered as a dust particle while the smaller particles can be considered as molecules of a gas. On the left is the view one would see through a microscope. To the right is the physical explanation for the "random walk" of the dust particle. This is an animated gif made for computers unable to run Java. 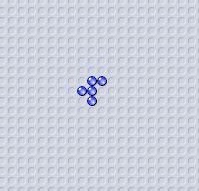 The original applet, credits, and a lecture on Brownian Motion can be found at http://galileo.phys.virginia.edu/classes/109N/more_stuff/Applets/brownian/brownian.html. NOTE: To see the Java applet, you'll need to have the Java plug-in working on your web-browser. This FLASH animation is from "Flash Animations for Physics," by David M. Harrison, Department of Physics, University of Toronto. This is not a pre-drawn cartoon: Newton's equations are actually embedded in the Flash, which simply takes your settings and plots the mathematical output in graphic form. If you check the button for addional independent planets, you should nderstand that these are not really 'additional' planets—they are identical and don't exert any gravitational influence on one another. So what they really represent is the same planet in four slightly different starting positions. The differing trajectories they follow illustrate, in essence, the same mesage as the "Butterfly Effect": very small differences in input can have very large effects on output. Here is a link to an interactive Java applet on the double pendulum from the Virtual Physics Laboratory at Northwestern University. This FLASH animation is from "Flash Animations for Physics," by David M. Harrison, Department of Physics, University of Toronto. Invented in 1970 by John Horton Conway, Professor of Finite Mathematics at Princeton University. [This is discussed in Waldrop, Complexity--check the index for references. See also Daniel C. Dennett, Darwin's Dangerous Idea: Evolution and The Meanings of Life (New York: Simon & Schuster; Reprint edition, 1996), pp.166-176.] This simple mathematical exercise led investigators to a great many other ideas, but it also led directly to the entire field of "Artificial Life." Same videos, other formats, below. Play the game yourself. 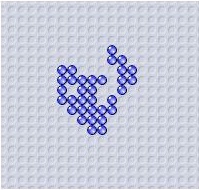 Various Game of Life applications can be downloaded free from http://www.ibiblio.org/lifepatterns/. You'll have to install it on your own computer, of course. Although it may look like a street in India, this is actually the Westphalian state system. (A Flash version). Another complex adaptive system at work? Eric Berlow: "How Complexity Leads to Simplicity"
TED Global, 2010. Filmed July 2010. Posted on TED November 2010. Click the image below for a larger, reasonably high-resolution version of the Afghanistan graphic to which speaker Eric Berlow refers. James Gleick on his famous book, Chaos. The Secret Life of Chaos (BBC 2010). Full Length Documentary. This video has been removed from YouTube and appears never to have been published by the BBC on DVD. However, you can find a great deal of video and information on it at http://atheistmovies.blogspot.com/2010/01/bbc-secret-life-of-chaos.html. There is a low-bandwidth version of the video here.